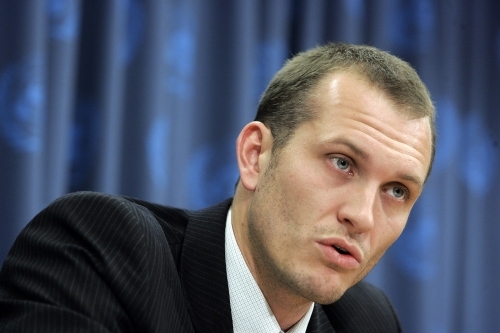 Jason Stearns meticulously describes the background to the two Congolese wars "The Great War of Africa" during which over 5 million people died. This is a compelling tale of massacres, failed states, rogues and idealists. 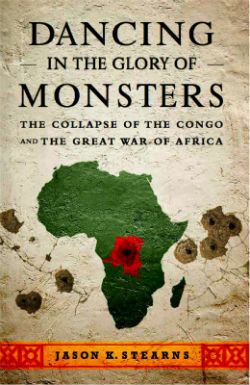 “Dancing in the Glory of Monsters” is the powerful and disturbing story of “Africa’s Great War” which took place in what is now the Democratic Republic of Congo (DRC) – previously Zaire and the Belgian Congo – a country the size of western Europe that borders nine other countries. The book is a balanced account based on numerous interviews and meetings with genocidiares, ministers, generals, child soldiers, rapists and victims of every horror imaginable. Stearns takes a step back and looks at the economic, political and social forces that triggered a series of retaliatory massacres and military invasions leading to 5.4 million deaths between 1996 and 2003. He is the first to be awed by the task ahead of him: “How do you cover a war that involves at least 20 different rebel groups and the armies of nine countries, yet does not seem to have a clear cause or objective?”. Here was a war that was actually 40 or 50 interlocking wars. The book does an excellent job in tracing the untraceable. The first Congo war was started in 1996, almost surreally, when Congo’s miniscule neighbour, Rwanda invaded (a bit like Costa Rica successfully invading the United States). In a sense the war was a direct result of the 1994 Rwandan genocide, which saw 800,000 predominantly Tutsi Rwandans massacred in 100 days by the ­majority Hutu. However, once the Tutsis had established themselves in power in Rwanda, they realised that there still existed a threat from the Hutus and genocidiaires that were living (or hiding out) in squalid conditions in camps managed by Western aid groups just over the border in Congo, mingling with the genuine victims who had not taken part in the massacres – some say over a million. The Tutsis decided not to wait paitently for what they saw as an inevitable war and invaded Congo to clean out the refugee camps. The Rwandans joined forces, partly as “moral cover” with a group of anti-Mobutu revolutionaries such as Laurent Kabila and a group of Congolese Tutsis living in eastern Congo, fighting under tha banner of the ADFL (Alliance of Democratic Forces for the Liberation of Zaire). Offering support were Ugandans, Angolans, Zimbabweans and Tanzanians – some offering equipment and weapons, others soldiers. Their aim was to overthrow the Zairian dictator, Mobutu Sese Seko, an aim they managed to achieve with alarming speed. In less than a year they had reached the capital, Kinshasa, and overthrown Mobutu, replacing him with Laurent Kabila. There was also an almighty slaughter. The Rwandans, moving across the Congolese border, chased those in the refugee camps into the jungle and massacred anyone they could get their hands on. Those that they did not hunt down died of disease (typhoid, cholera, diarrhea) and starvation. Stearns speaks with many of the victims and the stories make the blood run cold: stories that depict human cruelty that has gone almost beyond excess. Yet again, Hannah Arendt’s Banality of Evil is at work. Many of the people that Stearns speaks to cannot explain why they took part in the massacres – they felt some shame but could offer no explanation for their actions. There was something almost normal about it. The history of these wars – which seem destined to be passed over by history – is important not only for the number of deaths but also for the sense of surreal normality that accompanied the carnage. The Congolese were totally unprepared to fight a war. Mobutu had reduced the country to an empty shell and the army was almost non-existent. Some Congolese, almost in desperation, even saw the Rwandans as liberators despite their aversion to Tutsis, such was their disaffection for Mobutu and his dreadful 32-year reign. Mobutu had stoked the flames of ethnic hatred against the Tutsis and especially those Tutsis who were also Congolese (aliens in their own country) but as Stearns points out, the differences between Hutus and Tutsis are complex, and cannot be reduced to a few facial features. Laurent Kabila took his countrymen to task for “dancing in the glory of monsters” referring to their acquiescence to Mobutu and his reign, but as it tuned out Kabila was not much of an improvement. Laurent Kabila’s presidency was almost as bad as that of Mobutu but it only lasted a couple of years before another war broke out. This time the alliances were less clear. 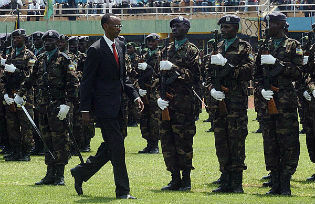 Kabila had some support, with ­Angola and Zimbabwe sending in their own troops to keep Kabila in power, but Rwanda and Uganda were trying to oust him, made simpler by the fact that the Rwandans still had their own men in place in the Congolese army. But this war was different. The first Congolese war was about politics, but the second one was clearly about money and natural resources: cobalt, diamonds, copper and coltan. The grubbiest of deals were made for ready cash to buy arms, the country’s resources sold off to the the highest bidder with ready cash. The war raged on until Laurent Kabila was eventuaally killed by one of his bodyguards in 2001. His son Joseph was quickly ushered in as president and to his credit, he managed to broker a fragile peace deal in 2003. The massive death toll of the wars dwarfs the massacres of the First World War and the Cambodian Killing Fields. Nevertheless the wars in the Congo were, and continue to be, under-reported partly due to the fact that the web of alliances and interests are completely unfathomable, even to many Congolese. There were too many wars going on at once, including proxy wars simultaneously being fought by neighbouring countries within the borders of this vast and uncontrollable nation. Interestingly, for a country that is considered a rogue state with no functioning government, the Congo was not always thus. Back in the fifteenth century, the Kongo Kingdom along the Atlantic could field a standing army and even had ambassadors in Spain and Portugal. However the region experienceed constant disintegration in the centuries that followed, losing several million Congolese to the slave trade and then suffering at the hands of the Belgian colonialists who destroyed the country, using it merely as a reservoir of mineral wealth. Since then Mobuto and the Kabilas have been hell-bent on maintaining power, reluctant to create a civil society that would inevitably oust them. Chaos was preferable – less threatening. Stearns has used his many years of experience in the Congo to meticulously unravel not two major wars but dozens of small wars and a web of violence and exploitation that at times defies comprehension. The acclaim that the book has received from all quarters is justly deserved and goes a long way to rectifying the dearth of accurate information about what must be one of the most shameful episodes in human history.